Trams 1, 2, 5 - Stop at Koningsplein. Very tasty Reistafel. Although restaurant was busy, service was excellent. Very good vfm. Wanted to experience a rice table so had heard from a local that this restaurant was one of the better ones - did not disappoint! Having been to a competing Indonesian restaurant earlier in the week, Sampurna surpassed our expectations on every level. The food was outstanding, with varied spice levels and textural differences throughout the rijsttafel. The skewers were the highlight of the meal, with the goat, chicken and beef skewers all incredible. Indonesian delights at its best. So fun to experience the numerous plates in the phenomenal Rijsttafel meal that is truly worth the trip! It was fun to try rijkstoffel but be aware that the food is very spicy even if it doesn't have a red chili pepper next to the dish. The servers are very nice. Excellent food - we had a rice table and enjoyed all. Wanted to try Indonesian food. Didn’t find the staff helpful. Try somewhere else. Nothing special to report here other than to say it’s a bit pricey for what is delivered. There are far better places in Amsterdam for Indonesian food and rijsstaffel. Made reservation at Sampurna to have Rijsttafel, a Dutch Indonesian colonial rice table. The food was well prepared, seasoned, and presented. There was more than enough food for my wife and I. I highly recommend making reservations. People without reservations were told they had to wait for over an hour since the restaurant was full. 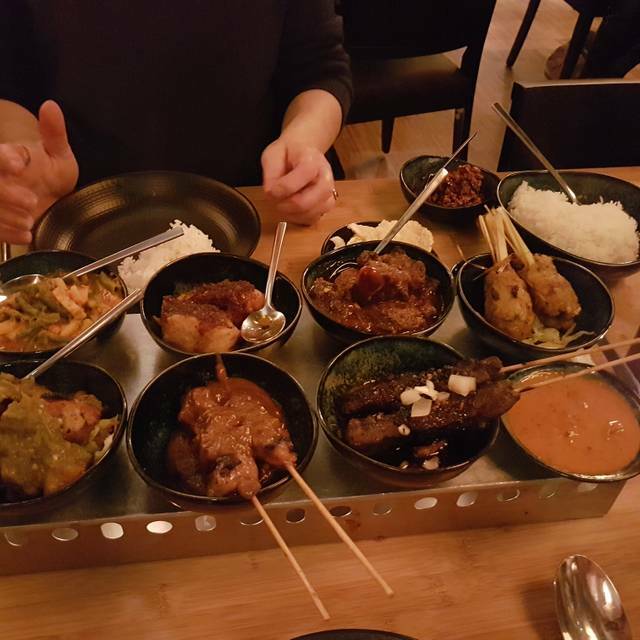 Having lived in Indonesia years ago and visiting Amsterdam for the first time, we searched for rijstaffel .... we loved the food and the experience. The location was great (about halfway between Centraal Station and Van Gogh Museum) and easy to reach via tram. The food was authentic, efficiently presented by a friendly Javanese server who reminded me how to say “thank you” and “good night” in his native language. Great restaurant, though small, a bit cramped and pretty noisy since tables are so near to one another .... we would return and do recommend as an authentic and delicious dining experience. This is a busy restaurant but everything was pretty average and unremarkable. Small but cozy place. Food is tasty! Heerlijk eten, fijne bediening en mooi ingericht. Een tafel aan de muurkant is perfect, de middenrij tafels zijn minder prettig om te zitten. Absoluut een aanrader als je van echt en smaakvol Indonesisch eten houdt. Seriously, one of the best meals I've ever had! Would go back to Amsterdam just to go there (and plan to!). Wij maakten een reservering via deze web-site. De reservering werd bevestigd. Toen we aankwamen bleek het restaurant geheel gesloten te zijn. Wat een kut-restaurant. Hoe weinig professioneel. Volgende keer gaan we weer naar Blauw waar de blauwen van wanten weten. PS Wij waren van plan er in maart met een aantal zakenrelaties uit Canada naar toe te gaan. Gelukkig zijn er talloze andere restaurants in de buurt. Bij aankomst bleek het restaurant gesloten in verband met verbouwing. Dat had men bij de bevestiging van mijn reservering wel even mogen melden. Nu moesten we op het allerlaatste moment op zoek naar een alternatief. Went here with a friend from Indonesia whom missed the Indonesian food in Europe. She and I were absolutely delighted with the variety of dishes. Almost authentically spicy, closest to home I have tasted in Europe so far. Service was really kind and attentive. We will certainly come back when we get the chance!